A new book by Diane Setterfield is cause for celebration. Her freshman outing, The Thirteenth Tale, was a delicious gothic novel involving the daughter of a bookseller and a ruined old house. Universally loved, it was – surprisingly – a genuinely wonderful book. Popularity doesn’t always equal quality but it certainly did with The Thirteenth Tale. A delightful surprise and well-deserved success for a new writer. Like other fans of her first book, I’ve been looking forward to her second. It’s a wait that’s felt interminable: six years to be specific. But she’s come through with a corker, a second book arguably better than her first. Young Will could never have dreamed the ramifications of killing a rook, an act he regretted but too late. The price he pays throughout the remainder of his life is inordinately steep, the story accompanied by Setterfield’s complete and thorough re-telling of the legend and lore of the rook, a bird with a long and storied past. The tale unfolds slowly. Deliciously – though painfully – so, as Will grows up, marries and makes his way in the world. In the great scheme of things, despite the loss of so much he should have felt more, all that motivates him is success in everything he touches. He’s willing to work for it, around the clock if necessary, with more efficiency than any other human being could be expected. The toll it takes, in the form of nightmares and insomnia, brings him low but his determination powers him through. Yet, curiously, it isn’t the money he craves. He lives the life of a monk in his cell. Rather, it’s his mania for excelling he cannot resist. Others in his circle who see his success at first feel jealousy, yet once they weigh the cost find it not at all worth the price. William Bellman ultimately builds around himself an empire, dedicated to the expensive necessities surrounding mourning in Victorian society, a time in which the observation of death is virtually a competition. The proper accoutrements surrounding it are many and expensive, if done correctly – and they must be done correctly. Only the dirt poor were excused from showy, lavish funerals requiring everything from the appropriate crepe cloth for black dresses to the nodding black feathers adorning the six horses pulling the funeral carriage. Death being inevitable, and the Victorians holding it in such esteem, the business is secure. After all, one thing no one can escape is dying. Success building upon success he soon becomes one of the most respected and prosperous businessmen in the city. But oh, the price he pays. The more wealthy he becomes, the less human he behaves. Paranoia mounts. He starts seeing birds everywhere: threatening, purply-black birds with sharp beaks an implied threat. In the background a certain Mr. Black lurks, a mysterious, threatening entity from earlier in William’s life. As with the nightmares and the paranoia and the horror of birds, Mr. Black inspires in him a level of dread and white-knuckle fear he can’t express but also can’t escape. 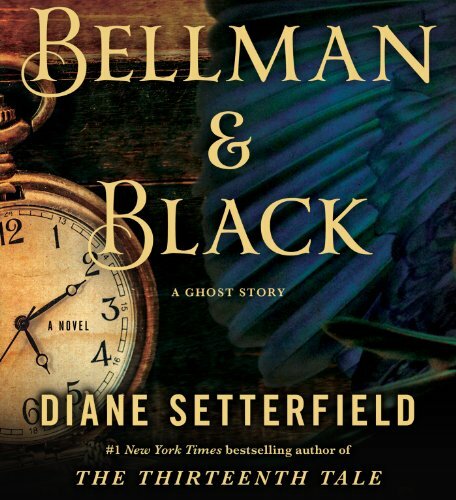 Of course I won’t spoil the plot for you; that would be as much a tragedy as the storyline of Bellman & Black, a novel that moved me deeply. It’s gothic, improbable and filled with hints of the supernatural, yet at its core the truth is all too possible. What makes the heart ache are the brief moments of clarity, when Will realizes what he’s become yet does nothing. His drive to succeed is just too strong; it is his undoing. And the prose! Flawless. I love finding little niggling details to complain about in every book but I couldn’t find even one in Setterfield’s second book. For all that The Thirteenth Tale was an especially well-written book, this one really is – as I said earlier – even better. If you loved her first book you should consider pre-ordering – or putting on hold at the library – Bellman & Black. Did this book take so long because she was going over it with a fine-toothed comb? Certainly seems like it. And it was worth the wait. You will love it. YOU WILL. Easily one of the best books I’ve read this year. Thank you to NetGalley for my e-Galley of this book. The history of the observation of death in the Victorian era is fascinating to explore. Books written about it are many and would be an excellent complement to this novel. FACTOID: in the Victorian era it was not uncommon to pose a corpse into a life-like position, in order to take a portrait. Sometimes these were family group portraits and often eyes would be painted onto the dead loved one’s lids to simulate life. Google the Victorian death portraits if you can stomach it. I just hated this book so much. I was so disappointed after The Thirteenth Tale. While I can see some of the reasons you loved this one, I just found myself saying, NO NO NO. : ) I love having different opinions though. Ooh, now I’m really intrigued.